Welcome on the website of the Biobased Structures and Materials group. Biobased Structures and Materials is a research area of the section Structural and Building Engineering. The first subject deals with drying and strength grading of timber. For the strength grading non-destructive test methods are used. The group has a state-of-the-art drying chamber for steam drying and a MTG for advanced studies. The second subject deals with jointing and fastening techniques. 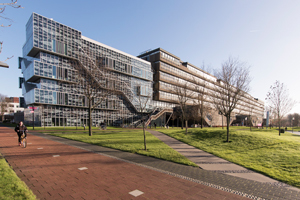 This has been a traditional area for Delft University of Technology, but the focus was mainly on experimental testing. This has been expanded and now theoretical, numerical and experimental work is being performed. The third research area deals with service life modeling of timber structures. Speciel models are under development combining several degradation mechanisms, taking into account mechanical, physical and biological loads, The models are being used for the assessment of monuments, buildings and structures in road- and waterworks as well as pile foundations. Education in sustainable timber buildings and structural applications in buildings, bridges and hydraulic works.